If you’re planning to start a family choose Pre-Seed Fertility Friendly Lubricant, clinically proven to be ‘fertility friendly’ for couples trying to conceive (TTC). Formulated to mimic your body’s natural fertile fluids, Pre-Seed is a glycerin-free formula that will not limit or damage sperm, unlike other leading spermicidal lubricants and is recommended by leading fertility experts and used in fertility clinics worldwide. What makes Pre-Seed safe for use when trying to conceive (TTC)? 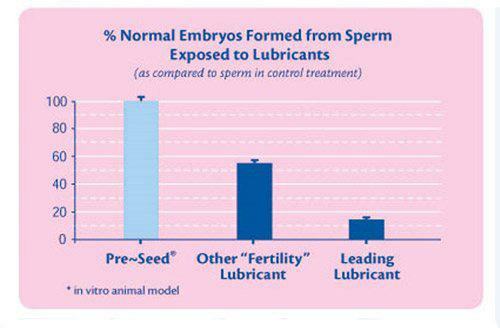 Pre-Seed is clinically shown to be a fertility-friendly lubricant. Pre-Seed allows the healthy sperm to move freely. Pre-Seed is isotonic and pH balanced to mimic fertile fluids. Pre-Seed was developed by a female doctor. Published clinical studies show Pre-Seed does not harm sperm. Published clinical studies show Pre-Seed has less potenial to irritate sensitive vaginal and cervical tissues in comparison to other leading lubricants. We tried this product the first time and we really liked it. We are hoping that we will get pregnant anytime soon. Fingers crossed! We are trying to get pregnant for a long while now and some friends recommended preseed. I hope this will work for us and its a very good product. I love Preseed! It feels nice to use. I hope this will eventually result to pregnancy.. i am hopeful.. This worked for us. Now we are 2 months pregnant! I would recommend! Preseed was recommended to me by a friend who swore on this product. I have been trying to be pregnant for a few months now and i hope this time it will work with the help of preseed. I used preseed before when I had my first baby and now we are working on for the second one and we are again using preseed. I hope it will work wonders for us again.. I am not sure of how effective the pressed is yet as I have just started using it but it feels nice and makes those dry spells better. My husband likes it very much too..
A little goes a loooong way for this.. You can maximize your use with the product. Hoping to be pregnant soon. Cant hardly wait! I only had to use it during one cycle before I saw the result! I got pregnant!!! Amazing! I was trying for 7 months now, so I am so happy! It was worth it. Definitely recommend it!!! It works!